Last week marked the arrival of ‘Stock up Saturday’ – also known as 5th October, the day that people kick-started their Christmas shopping! With only 10 weeks left until the big day, spreading the cost of your Christmas shopping bit by bit can help you save, while ensuring that you manage to buy all of those presents in time for December 25th! 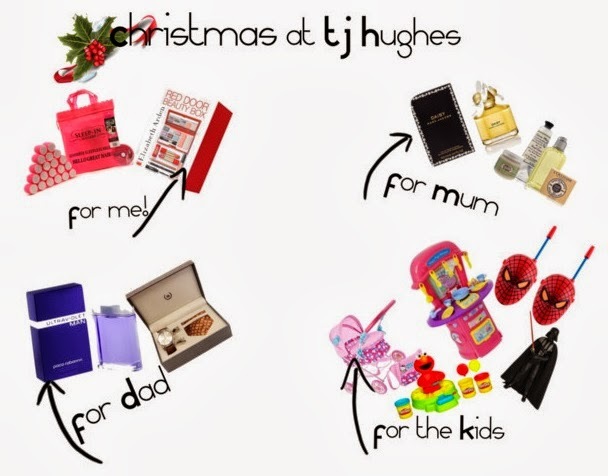 Here at TJ Hughes we know how important it is to keep Christmas within a budget – that’s why you will find amazing savings on all of our products. From cheap toys and games for the kids to beauty buys for Mum and favourite aftershaves for Dad, there are plenty of Christmas must-haves on our online store. If your child loves Peppa Pig, they are sure to love one of our Peppa Pig toys for Christmas. The Peppa Pig My First Kitchen Set is a favourite here at TJ Hughes and is sure to provide hours of full imaginative fun for your youngsters. Little lads will look forward to unwrapping their own Darth Vader action figure, and kids will get up to all kinds of mischief with our Spiderman walkie talkies. Don’t forget to spoil Mum this Christmas with a beautiful new perfume. Here at TJ Hughes we have got a fantastic selection of cheap perfumes including the gorgeous scent of Marc Jacobs Daisy – presented in a stylish flower topped bottle, this perfume really does smell as good as it looks! We’ve also got great gifts to keep Dad happy this Christmas – with everything from watch gift sets to aftershaves. While you are buying gifts for everyone else, make sure you pick up a few treats for yourself, from celebrity favourite Sleep In Rollers to beauty gift sets, our pampering products are perfect for spoiling yourself this Christmas! Dear fellow shoppers, I would highly recommend NEVER using TJ Hughes to purchase any goods as they leave completely in the dark. To order a bed means two seperate delivers, delivery confirmation received, mattress arrives and still waiting for base. No e mail, no contact...nothing. Stayed in all day, called twice to confirm goods on lorry and told 'yes' both times and that "it was a matter of just waiting". So waited all day and assumed by 9pm last night they were not coming and of course paid £30.49 for delivery. Some of you may have had more positive experiences, however I suggest causion before ordering as you clearly get what you pay for. Obviously just my humble opinion.